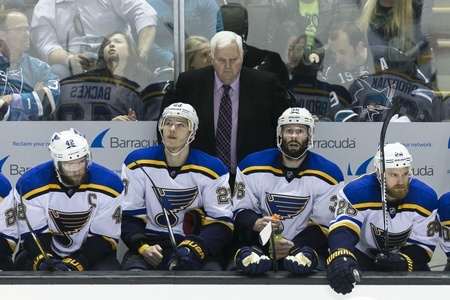 The St. Louis Blues are ready to take at least one more kick at the can with Ken Hitchcock behind the bench. The club announced the signing of the head coach to a one-year contract, cementing him for a sixth season with the Blues. Armstrong offered one-year contracts to everyone on Hitchcock’s coaching staff, but associate coach Brad Shaw turned the offer down and will explore other options. Kirk Muller will remain for another year, with some suggesting he could take over the reigns after Hitchcock retires. Hitchcock’s Blues made it to the Western Conference Final, where they lost to the San Jose Sharks in six games but put up a good fight. The post-season run marked the first time the Blues won a playoff series since 2012. Under Hitchcock, St. Louis is 20-27 in the post-season. They went 10-10 this year. In 363 regular season games with the Blues, Hitchcock is 224-103-36. His .667 winning percentage is the best in franchise history. Despite the disappointment in the conference final, the Blues do have a lot to be proud of. They took down the defending champs and dispatched the top seed in the Western Conference, which only leaves them hungrier for next season. Hitchcock has 19 years of coaching experience in the NHL, with 757 wins in 1,404 games with the Dallas Stars, Philadelphia Flyers, Columbus Blue Jackets, and Blues. If he manages 26 more regular season wins, he’ll pass the great Al Arbour for third place on the all-time list. That puts him behind Scotty Bowman and Joel Quenneville, which is obviously some pretty great company. Hitchcock won a Stanley Cup with the Stars in 1999 and led them to the Stanley Cup Final a year later. He won the Jack Adams Award in 2012 and has seen international success with Team Canada at three different Olympic events.